Photo by Alex Stevens (2004), courtesy Delores Tousinau. Caleb's father Thomas Brooks died at Concord, intestate, 21 May 1667. The male heirs—three sons and son-in-law Timothy Wheeler—presented an inventory of the estate for probate 16 Jun 1667, and the following day signed an agreement for division of the estate. Caleb's brother Joshua, as eldest son, was to have a double portion, the usual custom. Whereas Thomas Brooks, of Concord, hath left an estate, and the sonnes of the said Thomas not willing to troable the Court have Joyntly agreed that it shall be divided as followeth. First That the Inventory taken by Deacon Mirriam, Deacon Potter, and George Wheeler shall be accounted the full estate of Thomas Brooks. 2ly. wee do agree that Joshua Brooks shall have a full double portion out of the lands at Meadford, and the 3: other sonnes, Capt. Timothy Wheeler, Caleb Brookes, and Gershom Brookes to have equall portions, only Caleb and Gershom are to have the remainder of the said land after Joshua is first accomodated as a part of their portion, and Timothy Wheeler out of the moveable estate, and all to be distributed to them by those 3. partyes that tooke the Inventory; unto whose finall determination we do severally bynd ourselves in a bond of 100£ apeece, to stand unto, as wee do witness by setting of our hands to this present writeing, the 17th of June. 1667. In the presence of us. Hugh Mason, Joseph Estabrookes. [S282] John Brooks Threlfall, "Thomas Brooks," 9, 10: "b. about 1632, probably in England." [S612] Melinde Lutz Sanborn, Index to the Deponent Records of the County of Essex, Massachusetts, 9:214, Caleb Brooks, 1684. [S222] Lucius R. Paige, "Massachusetts Freemen," 23, Caleb Brooke. [S185] Concord, Massachusetts Births, Marriages, and Deaths, 1635–1850, 9, Calib Brooks/Seuessan Atkinson m.
[S221] Clarence Almon Torrey, New England Marriages, 102, Caleb Brooks. [S182] Lemuel Shattuck, History of the Town of Concord, 37, 1666 tax list. [S1300] John Gorham Palfrey, History of New England During the Stuart Dynasty, 2:29: "Ward's laws of inheritance and of servitude borrowed principles from the Law of Moses. The oldest son of a parent dying intestate was to have 'a double portion of his whole estate, real and personal, unless the General Court, upon just cause alleged, should judge otherwise.'" [S1405] John Brooks Threlfall, Ancestry of my Children, 512, Thomas Brooks. [S83] Henry Bond, Watertown Genealogies, 2:719, Thomas Brooks. [S83] Bond, Watertown Genealogies, 2:721: 1680, as quoted. [S182] Shattuck, Hist. Concord, 365: 1670. [S185] Concord BMD, 14, Seusan Brooks d.
[S53] Gravestone, digital photo by Alex Stevens, Medford, MA, Mar 2004. [S48] Rev. Charles Brooks, History of the Town of Medford, 527. [S182] Shattuck, Hist. Concord, 214, legacy of Timothy Wheeler. [S354] Raymond David Wheeler, The Wheeler Genealogy, 1:67-68. [S368] Vital Records of Medford, Massachusetts, To the Year 1850, 346, Caleb Brooks d.
[S572] William Gray Brooks, "A Genealogical Account of the Brooks Family," 53-54. [S83] Bond, Watertown Genealogies, 2:721, 723. [S185] Concord BMD, 10, Susan Brooks b. [S185] Concord BMD, 11, Mary Brooks b. [S185] Concord BMD, 12, Mary Brooks b. [S185] Concord BMD, 13, Rebak Brooks b. [S185] Concord BMD, 14, Sarah Brooks b. [S185] Concord BMD, 15, Ebinezer Brooks b. [S185] Concord BMD, 16, Samuel Brooks b. [S185] Concord, Massachusetts Births, Marriages, and Deaths, 1635–1850, 1, Susanna Atkinson b. [S185] Concord BMD, 9, Calib Brooks/Seuessan Atkinson m.
[S185] Concord, Massachusetts Births, Marriages, and Deaths, 1635–1850, 15, Ebinezer Brooks b. [S185] Concord BMD, 15, Ebinezer Brooks, 21 Feb 1667. [S2128] James Emery Brooks, "The Family of Thomas Brooks of Watertown and Concord, Massachusetts for Eight Generations: Part I, Medford Branch," 2: 24 Feb 1670. [S36] James Savage, A Genealogical Dictionary, 1:260: 1693. [S221] Clarence Almon Torrey, New England Marriages, 102: ca 1693, Charlestown/Medford. [S318] Thomas Bellows Wyman, Charlestown Estates, 1:105, Thomas (2.) Boylston. [S83] Henry Bond, Watertown Genealogies, 2:721, 723. [S83] Bond, Watertown Genealogies, 2:723. [S318] Wyman, Charlestown Estates, 1:132, Ebenezer (3.) Brooks. [S1684] Theresa Opel, transcribing Colonial and Revolutionary Lineages of America, vol. 12. [S368] Vital Records of Medford, Massachusetts, To the Year 1850, 347, Ebeneser Brooks d.
[S572] William Gray Brooks, "A Genealogical Account of the Brooks Family," 64. [S572] William Gray Brooks, 61, 64. [S368] Medford VR, 346, Abigail Brooks d.
[S368] Medford VR, 347, Ebeneser Brooks d. (g.s.). 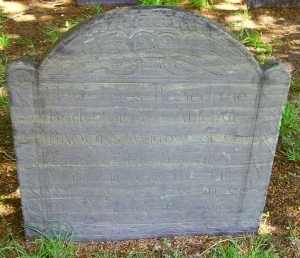 [S572] William Gray Brooks, 3, "Inscriptions copied from the Medford burying ground." [S368] Medford VR, 29, Caleb Brooks b. [S368] Medford VR, 30, Ebenezer Brooks b. [S368] Medford VR, 29, Abigael Brooks b. [S368] Medford VR, 29, Hannah Brookes b. [S368] Medford VR, 31, Mary Brooks b; 348, d.
[S368] Medford VR, 32, [T]homas Brooks b. [S368] Medford VR, 32, Rebecca Brooks b. [S368] Medford VR, 32, Samewell Brooks b. Her brother Peter Boylston was grandfather to President John Adams. Findagrave.com, memorial #26920724. Photo by BobBoston. [S319] Vital Records of Roxbury, Massachusetts, To the end of the year 1849, 1:36, Abigail Boylston bp. 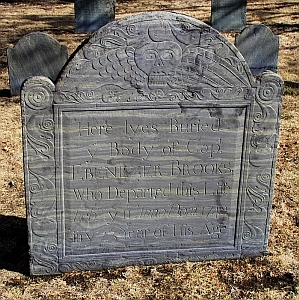 [S572] William Gray Brooks, "A Genealogical Account of the Brooks Family," 3, "Inscriptions copied from the Medford burying ground." [S572] William Gray Brooks, 61.